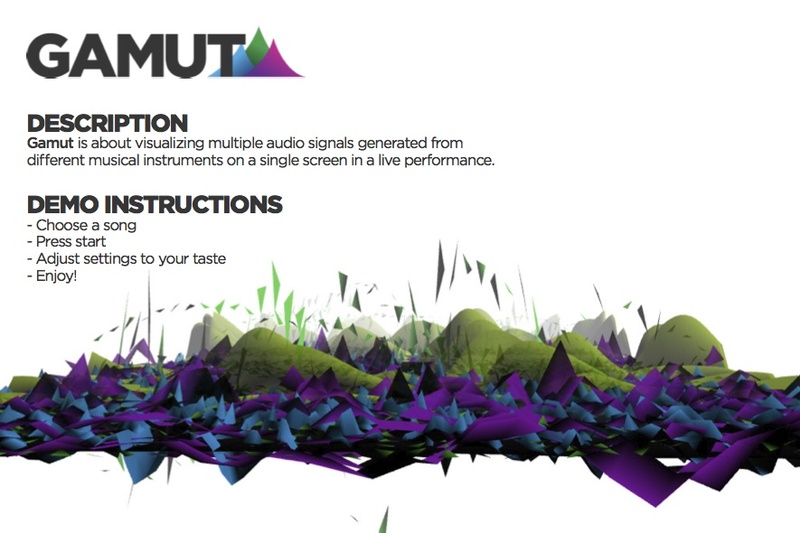 Gamut is about visualizing multiple audio signals generated from differ- ent musical instruments on a single screen in a live performance. My goal in this project is to create a simple, modern and elegant look- ing audio visualizer that responds to all activity by the musical instru- ments. In addition to that, the end product should be user friendly for the musicians to use without any complications. Music business is not just about the music anymore in the era we live in. It is a combination of visuality and sound. Lots of professional musi- cians pay huge amounts of money for special effects and shows on stage in order to make it a complete show and for spectators to havea great experience. Professional musicians ranking high in the business are able to afford all of these elements in their shows but that usually not the case with the musicians who play in small venues. Those peo- ple are the target group of the project. They are usually amateur or semi-professional musicians who try to keep up with the music busi- ness and grow their fan base. This project designed to make life easier for the musicians who want to support their stage performance with quality visuals but cannot afford expensive stage gear.